@BNani, to make sure you know whether you are running a 32 bits Windows or 64 bits Windows go to http://support.microsoft.com/kb/827218 and scroll down to the section that says "Automatic version detection results" and it should tell you what type of Windows operating system you are running. After that un-install the Java on your computer and download and install the correct version. @BNani, did you manage to get the Playgirlz Voter system running? The database is showing a new user. @Gokoulssj, thanks again for sending me your activity log. Found it particularly interesting to read this time because it shows an interesting bug where a sequences of events cause your program to never check in and/or receive config updates from the database after some point. LOL, sorry about the frequent updates guys but here it is again, Playgirlz Voter beta 1.0.16 is now available for download. Please see first post for instructions to download and install or upgrade to it. @PlayboyzAdam, anything I can do to help. Anytime you need them just let me know. I tried to use this program earlier, but it doesn't seem to work for me. I'm using the newest version of Firefox (32.0) and downloaded Java SE runtime as well (my Windows is 64x). After using for one hour, the program always crash and the vote count doesn't seem to leave the zero mark. I don't know what I'm doing wrong. Adam, can you help me? I really want to help any way I can. And sorry for my english; it's my second language. JungAh_Fan wrote: I tried to use this program earlier, but it doesn't seem to work for me. @JungAh_Fan, you're using the wrong version of Firefox, uninstall Firefox 32.0 from your computer and download and install Firefox 31.0 from https://ftp.mozilla.org/pub/mozilla.org/firefox/releases/31.0/win32/en-US/Firefox%20Setup%2031.0.exe Also make sure you uninstall Adobe Flash from your computer, if you need to view something that requires Flash, I suggest you download the Chrome browser because that has built-in Flash support. btw, my 'captcha' folder still empty.. is it normal? [SEREVE] Unexpected error occurred while trying to see if task UpdatePlaygirlzVoter is with... (can't see the rest of it because the program keeps crashing). Also, I know this might be a dumb question, but is there a specific time that I should be using this? Or I can vote 24/7 with no problem at all? iAMaPlaygirlz wrote: btw, my 'captcha' folder still empty.. is it normal? @iAMaPlaygirlz, yes that's normal. The captcha folder temporarily stores a captcha image(i.e. image containing text, required by a web page for the user to entered the text into the web page), once the Playgirlz Voter has read the image and enter the text into the web page, the image gets deleted. @JungAh_Fan, can you send me a copy of the activity logs please. You'll find the activity logs in the logs folder. Email the activity logs to AdamFeng1000000@hotmail.com The activity logs will contains the rest of the error message and other info to help me figure out what is wrong. JungAh_Fan wrote: Also, I know this might be a dumb question, but is there a specific time that I should be using this? Or I can vote 24/7 with no problem at all? @JungAh_Fan, I think that is a very good question. There is no specific time to be using the Playgirlz Voter. You can leave it running continuously and it'll know when voting starts, voting ends and votes when voting is available. If you don't want to leave it running continuously and you know when voting is available then you can choose to run the Playgirlz Voter during the times when voting is available. The most important thing right now is to run the Playgirlz Voter every day to get 4 MBC accounts a day to help OC place first in the Show Champion votes. @JungAh_Fan LOL, seems like Google Translate is doing a very good job. What language do you usually speak? Hi PlayboyzAdam and thank you for making this program. I have been waiting for such a thing a loooong time. I am planning on letting it run all weekend but I the program won’t work on my Dell and not on my Acer either. I have followed all the instructions, have the correct firefox, deleted my java plugin and I tried both the updated voter and the old one. I tried using the program yesterday and today but it generated nothing even though I let about 2h pass. Now it keeps freezing and if I look at the log it says something like “updating the playgirlz voter” but today it said “failed to update the playgirlz voter” and then it suddenly went back to just updating again. 2014-09-05T00:39:12|INFO|Task description: Update PlaygirlzVoter settings 25 times(s) a day. 2014-09-05T00:39:21|INFO|Task UpdatePlaygirlzVoter is not within its activity period yet. This task will be put to sleep for now. 2014-09-05T00:39:54|INFO|Task description: Update PlaygirlzVoter settings 25 times(s) a day. 2014-09-05T00:40:05|INFO|Task UpdatePlaygirlzVoter is not within its activity period yet. This task will be put to sleep for now. 2014-09-05T00:40:16|SEVERE|Failed to put a task to sleep. 2014-09-05T00:40:51|INFO|Task UpdatePlaygirlzVoter is not within its activity period yet. This task will be put to sleep for now. 2014-09-05T00:41:02|SEVERE|Failed to put a task to sleep. SwePlaygirl wrote: Hi PlayboyzAdam and thank you for making this program. I have been waiting for such a thing a loooong time. I believe SwePlaygirl and I have the same problem, because I wanted to load my log file, but there was no response. Even so, I tried to restart my computer, deleted everything on data/logs folders but the problem is still there. So, Adam, since I can't read/open the file, do you still want me to send the activity logs file for your e-mail? PlayboyzAdam wrote: @JungAh_Fan LOL, seems like Google Translate is doing a very good job. What language do you usually speak? JungAh_Fan wrote: I believe SwePlaygirl and I have the same problem, because I wanted to load my log file, but there was no response. Even so, I tried to restart my computer, deleted everything on data/logs folders but the problem is still there. @JungAh_Fan, that's interesting. Those log files are just normal text file, I can't figure out why your computer would have trouble reading them....unless they are really really big so they take a long time to load. How big are your log files? If those log files are more that 10 MB each then something is really wrong, actually I don't think they should be more than 3 MB each. Hmm..maybe there's some sort of compatibility issue with the Playgirlz Voter and the version of java that's on your computer or maybe you've installed the wrong version of Java. Without further information it's hard to figure out....if your log files aren't ridiculously big then email them to me. If your log files are bigger than 5 MB, delete your log files and everything that's in the data folder then run the program for 1 minute. Check to see how big the log file is and if it's less than 5 MB, email it to me otherwise repeat the process but this time run the program less longer than last time(maybe 15 seconds less) and keep on doing this process until you have a log file that's not too big and can be email to me. It doesn't matter whether you can read/open the log file or not as long as it's small enough so that you can email it to me. Download this program from http://wikisend.com/download/102174/Test.jar , run it and push the "Print System Properties" button. The program will create a file called "SystemProperties.txt" containing data that'll help me figure out the problem. Email me the SystemProperties.txt file. Don't worry, the SystemProperties.txt file doesn't contain anything info that will jeopardize the security of your computer. You can open up the file and check if you are unsure, and Google what the properties mean. When you email me the log files and SystemProperties.txt, let me know your ASDaze forum name so I know who is emailing me. @iloveAfterschool, first check whether it's a 32 bit Windows 7 or a 64 bit Windows 7 by going to http://support.microsoft.com/kb/827218 and scroll down to the "Automatic version detection results" section. @iloveAfterschool, if you've got a 64 bit Windows 7 run the program for about 1 minute and if the program doesn't start creating Mwave or MBC+ accounts within that one minute stop it and email me(AdamFeng1000000@hotmail.com) the activity logs(found in the logs folder). Right now I'm suspecting there's something wrong with the 64 bits Windows Java, but I need to get my handles on an activity log to first to help me diagnose the problem. Sorry it took me a while to get back to you! I tested the program late last night and decided to sleep and try it again in the morning. Sadly it did not work on either of the days so I am agreeing with your theory right now, that there is something wrong with the 64-bit of Java (even though I am clueless about technology.) Sadly enough I run 64-bit on every pc in the house…. Unless my mother’s Vista is a 32-bit. Should I investigate this and try to run the program on her Vista to give you more data? Only if her Vista is a 32-bit of coourse. Anyways I have mailed you my activity log, but it was too big so I copied and pasted it into a word document. I hope I did not ruin anything buy doing this. I could I hope you can find some useful information somewhere in them that will help you solve the problem. Oh right, almost forgot, to actually exit the program since it freezes once you touch it with a click of the mouse I have to exit it from the task manager (I think it is called that in English at least) because closing it normally takes several minutes. Another observation, since I can’t really tough the program is that I am also unable to scroll in the activity logs because they simply won’t move, although they won’t make the program unresponsive either. Oh well probably useless info but at least you have the activity logs now. Silly me forgot to give you the system properties, but I did that too and sent it to you in a second email. You are not pressuring me to vote at all, I am actually planning to vote every day but during the weekends I can keep the voter running for like 8+hours and during the weekdays only for about 4 hours so that is the difference for me. Also thanks for the explanation on why not to use more than one computer, I have now removed it from my slowest laptop. Hopefully my voting on weekdays will still be enough, it depends a bit on my schedule but hopefully I can vote for a minimum of 4hours per day. Once the problem with the voter is solved by the way I will promote it on an After School facebook group. We are over 9000 members and even though they are not all that active I hope some of them will also start to use it. My log file had 821MB [!] size - after running the program for one hour! After deleting it and running for one minute, it gave me a 40,8 MB file. I was going to send it to you anyway, but since SwePlaygirl already done it, I don't think it will be necessary anymore. Unless you need, of course. I can run and test the program in about 30 minutes on a 32-bit pc and see how it goes My logs were also big by the way, after about 15 minutes they were about 30MB. SwePlaygirl wrote: Once the problem with the voter is solved by the way I will promote it on an After School facebook group. We are over 9000 members and even though they are not all that active I hope some of them will also start to use it. @SwePlaygirl, 9000 WOW!!! Swedish Playgirlz FIGHTING!!!!!!!!! Thanks for sending me your activity logs and the SystemPropertie.txt file, they've been very helpful. Turns out there is a problem with 64 bit Java SE Runtime Environment 8u20, I think it is failing to parse dates properly. Just to make sure I'm right, do the following test for me. Download the TestDateParsing.jar file from http://wikisend.com/download/804966/TestDateParsing.jar , run it and push the "Perform Test" button. If it says "Date parsing test passed!" then I'm wrong but if it says something like "Date parsing test failed: ....." then it means the 64 bit Java SE Runtime Environment 8u20 really does have problems parsing a particulate date format. 1) Uninstall the current Java SE Runtime Environment. 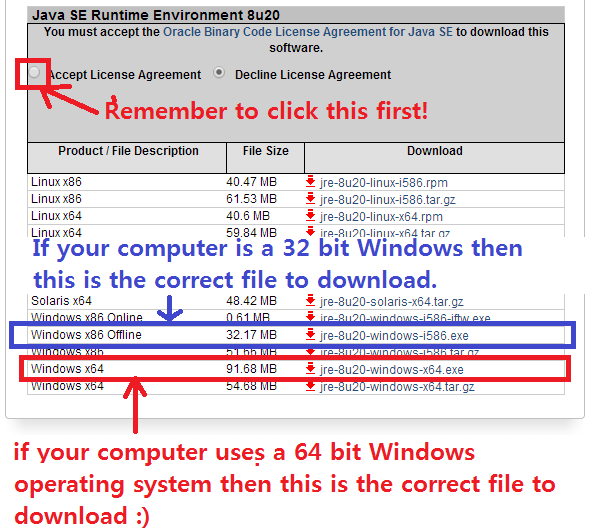 2) Go to http://www.oracle.com/technetwork/java/javase/downloads/java-archive-javase8-2177648.html and download "Java SE Runtime Environment 8u5". Be careful not to download the Server JRE files and Java SE Development Kit files. 3) Install the Java SE Runtime Environment you've just downloaded and run the TestDateParsing.jar test again. 4) If the TestDateParsing.jar test passes, delete everything from the logs and data folder of the Playgirlz Voter and run the Playgirlz Voter for about 1 minute. 5) If the TestDateParsing.jar test fails or after running the Playgirlz Voter for 1 minute and it doesn't start creating Mwave or MBC+ accounts then repeat steps 1 to 5 for different versions of Java SE Runtime Environment found in http://www.oracle.com/technetwork/java/javase/downloads/java-archive-javase8-2177648.html there's only 3 different Java SE Runtime Environment versions found there which are "Java SE Runtime Environment 8", "Java SE Runtime Environment 8u5", "Java SE Runtime Environment 8u11". Please let us know which one works if you find one that works. If you don't find one that works then I'm going to have to find some way to change the code so that the Playgirlz Voter works on 64 bit Windows. JungAh_Fan wrote: My log file had 821MB [!] size - after running the program for one hour! After deleting it and running for one minute, it gave me a 40,8 MB file. @JungAh_Fan, LOL that explains why you guys have so much trouble opening those log files. JungAh_Fan wrote: I was going to send it to you anyway, but since SwePlaygirl already done it, I don't think it will be necessary anymore. Unless you need, of course. @JungAh_Fan, thanks but I don't need it anymore. @JungAh_Fan, LOL I've got a 32 bit Windows and all the fans that have successfully installed it(that I know about) have 32 bit Windows so I pretty sure the problem is with the 64 bit Java SE Runtime Environment. I'm not sure if installing a 32 bit Java SE Runtime Environment on a 64 bit Windows works and I wouldn't recommend trying it. PlayboyzAdam wrote: Download the TestDateParsing.jar file from http://wikisend.com/download/804966/TestDateParsing.jar , run it and push the "Perform Test" button. If it says "Date parsing test passed!" then I'm wrong but if it says something like "Date parsing test failed: ....." then it means the 64 bit Java SE Runtime Environment 8u20 really does have problems parsing a particulate date format. 1) Uninstall the current Java SE Runtime Environment[/color]. I’m glad that my logs and system properties helped you. I just ran the test and of course I got the “Date parsing test failed.” But before I can install the other versions I have a questions. How do I uninstall the Java SE Runtime Environment 8u20? I went to the properties where you uninstall all downloaded programs but I did not find it, so can I just delete it from my laptop? Since you have a 32-bit yourself and it all works fine I think it is unnecessary that I install the program on my mother’s 32-bit. As soon as I figure out how to remove the current Java SE Environment then I will try the other ones to hopefully make it work. SwePlaygirl wrote: I’m glad that my logs and system properties helped you. I just ran the test and of course I got the “Date parsing test failed.” But before I can install the other versions I have a questions. How do I uninstall the Java SE Runtime Environment 8u20? I went to the properties where you uninstall all downloaded programs but I did not find it, so can I just delete it from my laptop? On your computer Java SE Runtime Environment 8u20 will be called "Java 8 Update 20" and it should be listed at "Control Panel\Programs\Programs and Features". If you still don't find it let me know. SwePlaygirl wrote: Since you have a 32-bit yourself and it all works fine I think it is unnecessary that I install the program on my mother’s 32-bit. As soon as I figure out how to remove the current Java SE Environment then I will try the other ones to hopefully make it work. @SwePlaygirl, thanks<3 it is important that we try our best to get the Playgirlz Voter working on 64 bit systems because there might be other fans that only have 64 bit computers.